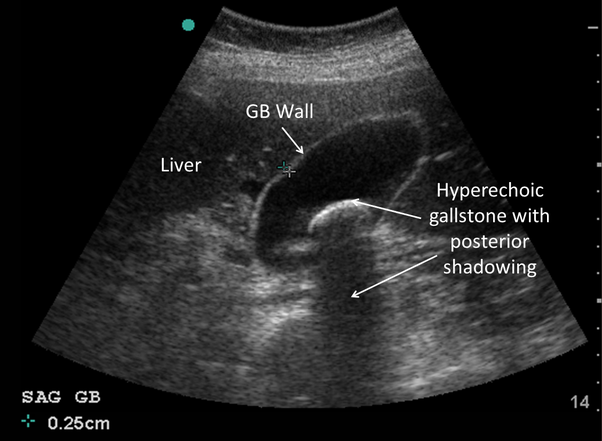 Ultrasound in the gallbladder uses high frequency sound waves to produce live images from the patient. This is a painless test and is very common today in the medical field. Ultrasound is sometimes referred to as an ultrasound chart, diagnostic ultrasound, or ultrasound. A medical professional who performs ultrasound is called a sonographer. Because ultrasound uses sound waves instead of radiation, it is considered a safety scan. Therefore, this is the preferred method of use during pregnancy. Ultrasonic diagnosis of internal organs, blood vessels and soft tissue structures. Although usually associated with use during pregnancy, ultrasound is used to examine many other parts of the body including the gallbladder, liver, kidneys, pancreas, bladder and many other internal structures. Gallbladder ultrasound is best performed after fasting because eating causes the gallbladder to contract, making viewing gallstones more difficult. Ultrasound is used for many reasons. If the patient is experiencing pain, swelling, or other abnormalities that require an internal view of the organ, the doctor can order ultrasound. Gallbladder ultrasound can be used to guide doctors or surgeons during surgery, such as biopsy. They are important in planning certain types of treatment and surgery and in determining the consequences of the patient's response to treatment. Ultrasound can be used to detect cysts, obstructions and infections in the body. They can also measure arterial blood flow to detect blockages. Ultrasound can be used to examine certain cancers in a variety of ways, including detecting abnormal tumors, growth, or lumps.